The GSMA estimates that 5 billion people around the world have mobile devices, and more than half of these devices are smartphones. According to Pew Research Center, rates of smartphone ownership vary between countries, as well as within countries. Not surprisingly, affordability of mobile internet is one of the main factors that determines whether or not someone is able to go online. Our latest visualization takes a deep dive into the price of mobile internet around the world. The data we used comes from Cable.co.uk and includes information from 230 countries and territories. 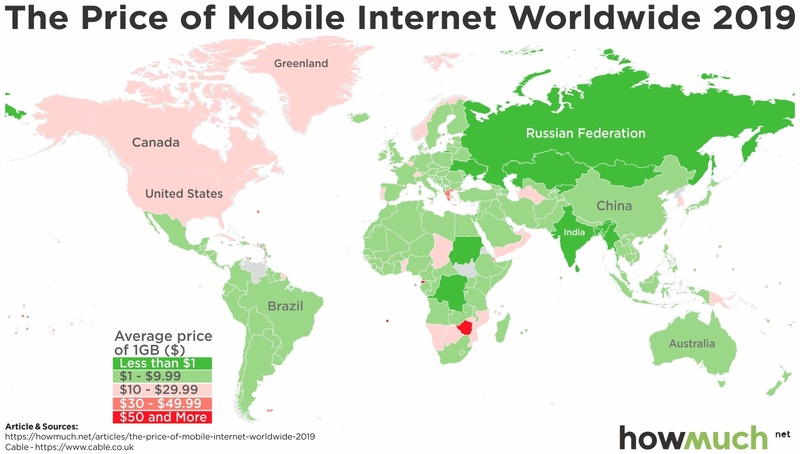 The colors on the map correspond to the price of 1 GB of mobile data in each country, with dark green being the cheapest at less than $1 and red being the most expensive at more than $50. Countries shaded in gray do not have data available. For ease of comparison, all prices are expressed in U.S. dollars. Africa is the poorest continent by GDP per capita. 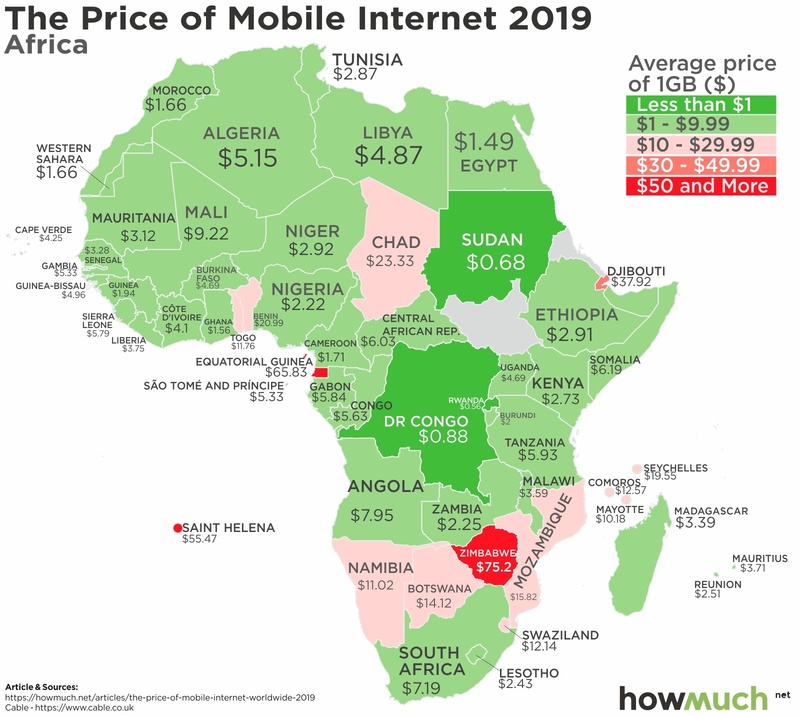 In Africa, countries in the southernmost part of the continent pay the most for 1 GB of data. Zimbabwe pays the highest price both in Africa and in the world ($75.20), and countries such as Equatorial Guinea ($65.83) and Saint Helena ($55.47) also pay more than $50. Conversely, Sudan ($0.68) and the Democratic-Republic of the Congo ($0.88) both pay less than $1 per GB. Within the Asian continent, countries in the Middle East and East Asia tend to have the most expensive mobile data plans. 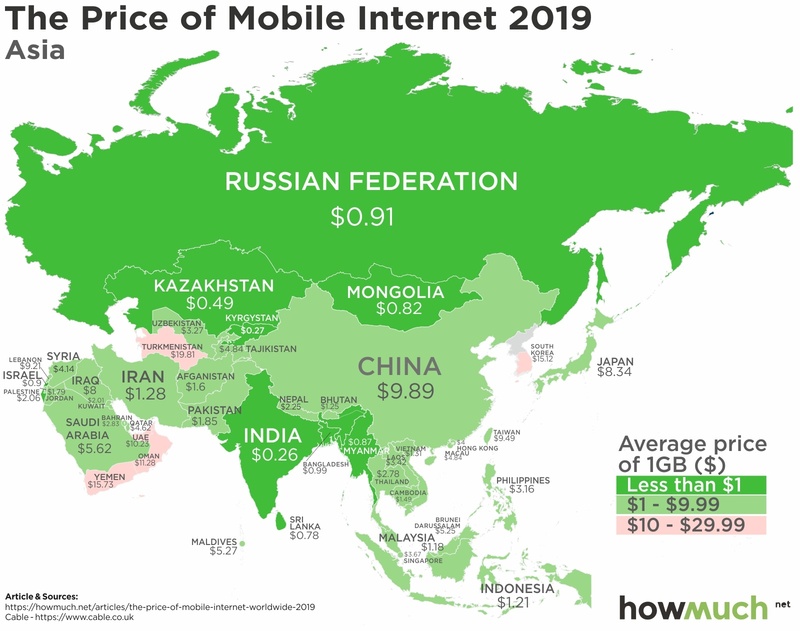 The exception is Turkmenistan, a Central Asian country which has an average price of $19.81 for 1 GB and is the most expensive country in Asia for mobile data. Most countries in South Asia, Central Asia, and Southeast Asia have plans that are less than $5 per GB. Some of these countries include Sri Lanka ($0.78), Indonesia ($1.21), and Kazakhstan ($0.49). The cheapest country for data around the world is India, which only charges $0.26 for 1 GB. European countries have a great degree of variation in cost for mobile data. 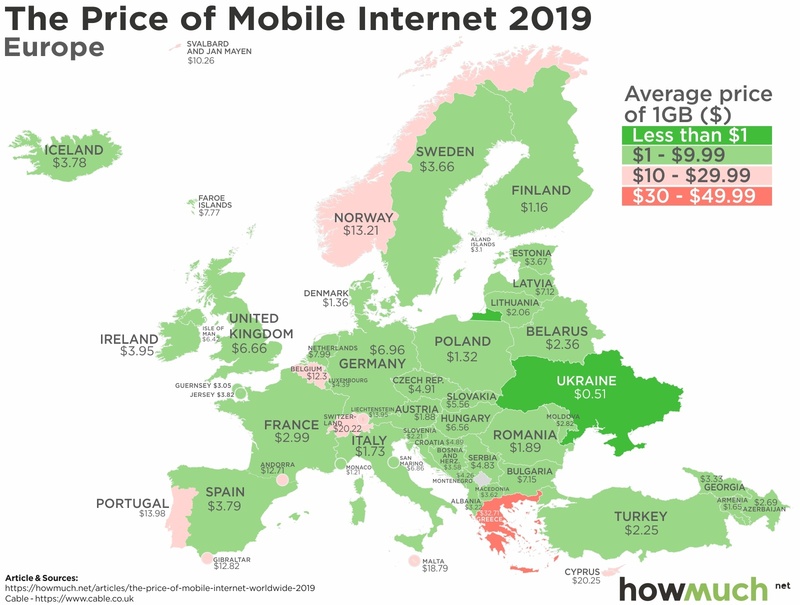 Several countries pay more than $10 for 1 GB, such as Portugal ($13.98), Greece ($32.71), and Switzerland ($20.22). However, Ukraine pays only $0.51. 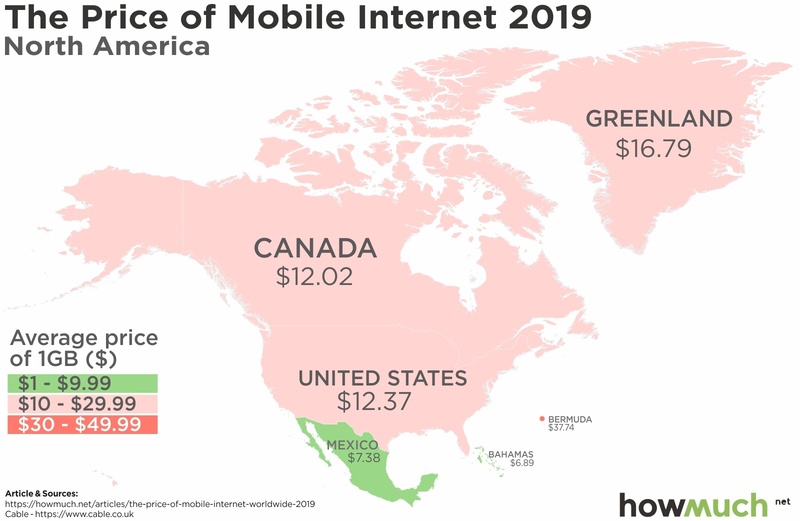 There are no countries in North America that pay less than $5 for data, making it one of the more expensive regions. Bermuda is the most expensive with $37.74 for 1 GB, while the Bahamas only has a price of $6.89. The average cost of data in the U.S., where 77% of the population owns a smartphone, is $12.37. Within the Oceania region, Australia pays the lowest average price for data at $2.47 per GB. By contrast, more isolated island nations such as Samoa ($30.09), Tokelau ($29.96), and Nauru ($28.13) all pay more than $10 per GB. 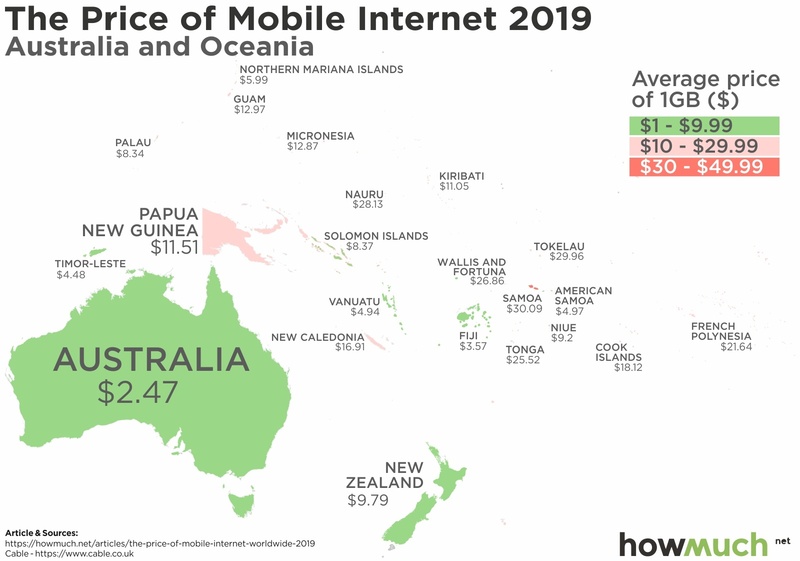 There are no countries in the Oceania region that pay less than $1 for data. 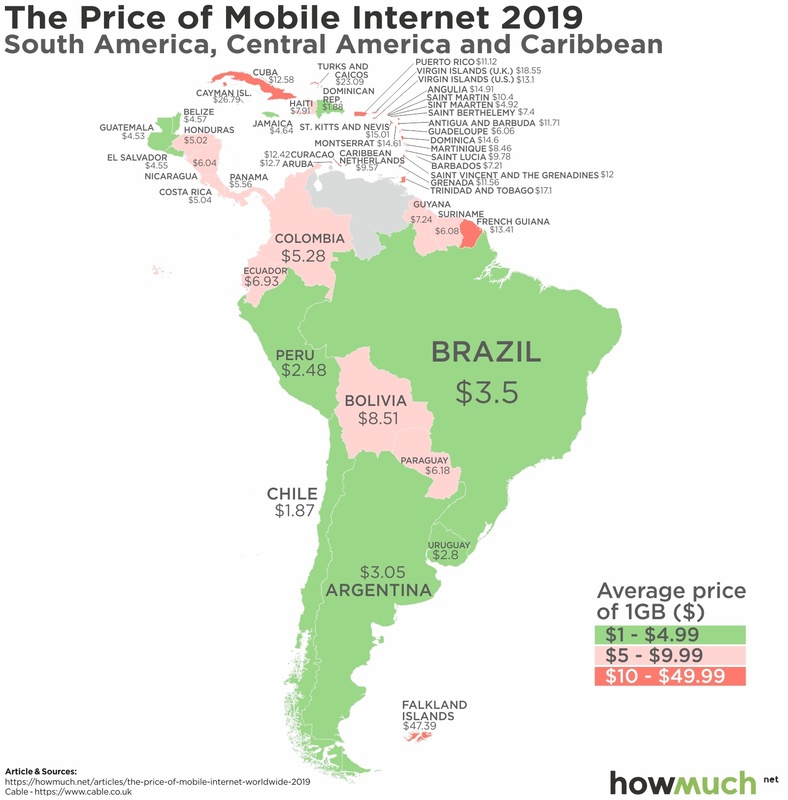 Countries in Central America and the Caribbean charge higher rates for 1 GB of data, and the Falkland Islands charge the most at $47.39 for 1 GB. Countries in the southern most part of continental South America, such as Chile ($1.87), Uruguay ($2.80), and Argentina ($3.05) pay less compared to the rest of the region. Cable.co.uk suggests a few possible reasons for the disparities in prices for mobile internet. For example, some countries have a fixed broadband infrastructure so providers can offer large amounts of data while maintaining cheap prices. For other countries, incomes and cost of living are much lower, so data prices follow that trend. Interested in learning about other economic differences around the world? You can view our visualization on how levels of prosperity vary between countries here.